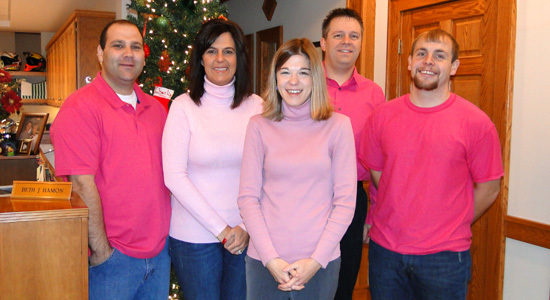 Today at work we all conspired to pull a joke on Charlie by wearing pink shirts. It's an inside joke and not very funny always. A few weeks ago, when I was shopping for my pink shirt, I decided to get the brightest pink shirt I could find. Nobody was going to out pink my pink shirt. I went to Express at Easton and bought a bright pink shirt they call Flame Pink. But one I arrived at work the two "straight" guys had shirts that were just as bright. J.J., Beth, Jessica, Me and Kevin.